There are millions of searches done on the Internet each day. Many of them have something to do with bacon! Pictures of dogs eating bacon instantly go viral. Bacon science facts are everywhere. Some argue that bacon goes with anything, there is bacon ice cream for example. Is bacon for you one of those foods that enhances every dish and makes it better – like magic dust sprinkled all about the kitchen? Whether you grab a bacon & egg sandwich for breakfast, a BLT or bacon burger for lunch or get stuffed by a creamy fettucine with bacon, you want to make sure your bacon is cooked the way you like it. 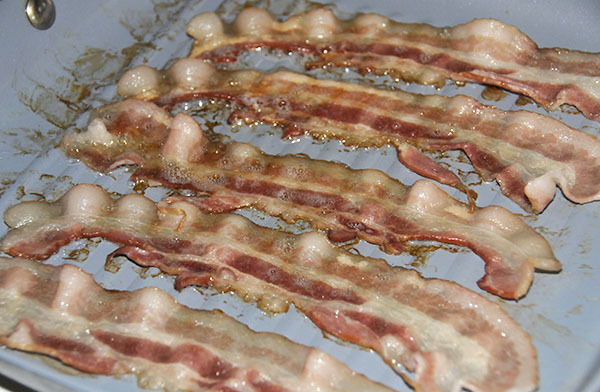 Most bacon lovers have a preference for the way their bacon is cooked. Some prefer a chewier, softer piece, still a bit flabby and flopping around. Others prefer a crisp, crust-like bacon that crumbles when you bite into it. Color can be a perfect indicator to regardless of your preference. 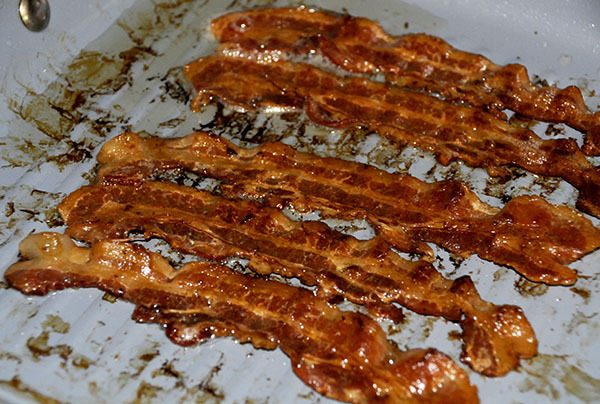 At this point, if you are a Vegan or Vegetarian, you may have already ceased reading this article – we hope not, because fake bacon has its own color palette. Click here to learn more. 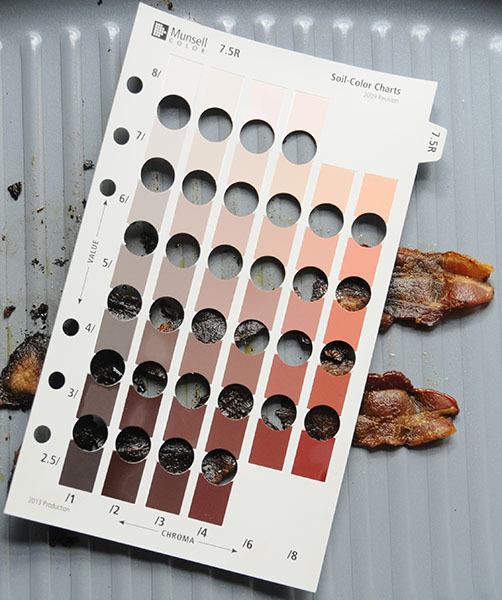 Although one could argue that the best color for bacon is the one you can’t see because it is already in your mouth, let’s patiently inspect the colors, while we soak up the aromas in anticipation. 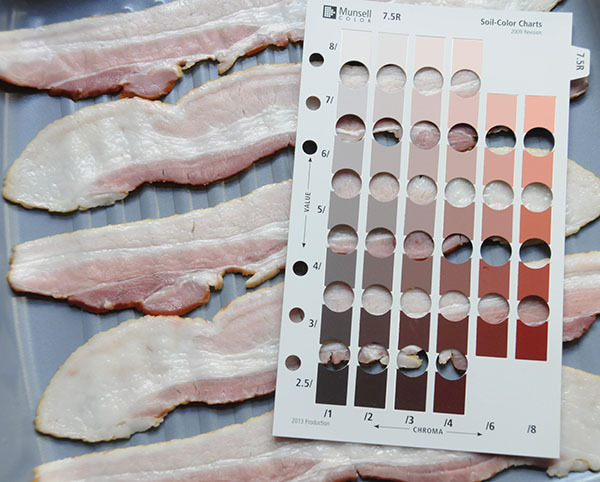 Right out of the package, bacon has an array of color from shades of white to pale and deeper pinks. 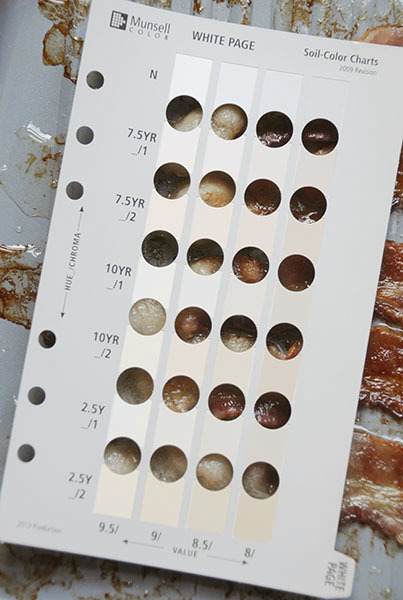 A quick peek of the bacon underneath the Munsell 7.5R Chart reveals all the variety of colors. 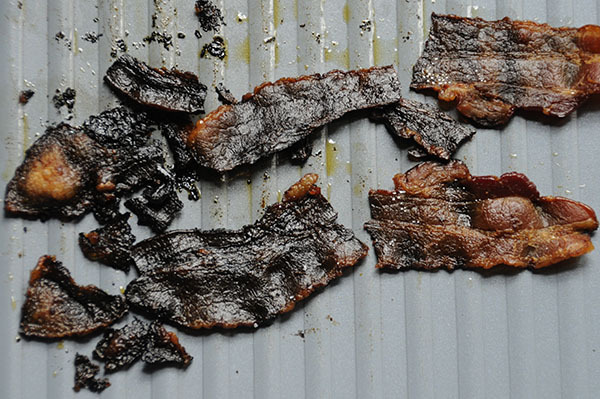 From raw to cooked enough to be safe, for those who like a more chewy bacon experience. 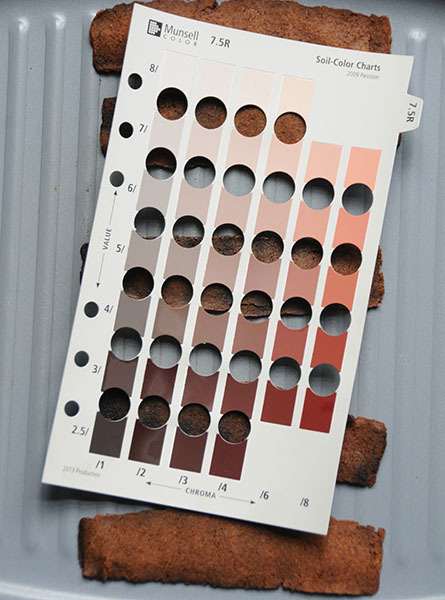 A view with the Munsell 7.5R color chart. Taking a look at the bacon fat with the White Page. Moving on to crispy bacon. Notice how the fat shifts to yellow hues and the meaty parts turn browner. With the Munsell 7.5R chart. For those that like things really well done. Bacon alternatives are made from many different combinations of ingredients, typically soy as the common denominator. The fake bacon strips when they are uncooked. Still using the 7.5R chart. Chewy, cooked fake bacon. Notice not much shift in color. Crispy fake bacon. Darker around the edges but fairly consistent in color in the center. 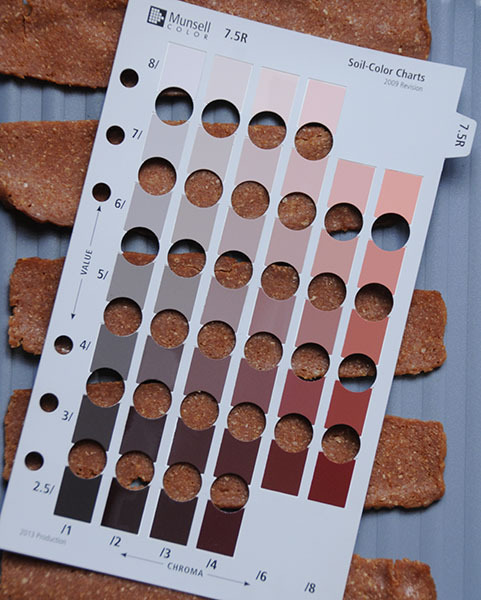 Professionals who work with food color standards reference the Munsell system. Cooking can be a great opportunity to sharpen your color notation skills. We think it’s time for you and your bacon to elevate yourselves to this professional grade level! Branch out and learn about the Munsell color tree while making this Epic Meal Time bacon tree. 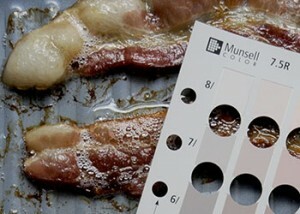 Every subtle unique shading of bacon as it cooks can be compared to an appropriate matching color in the Munsell system. Give it a try yourself. 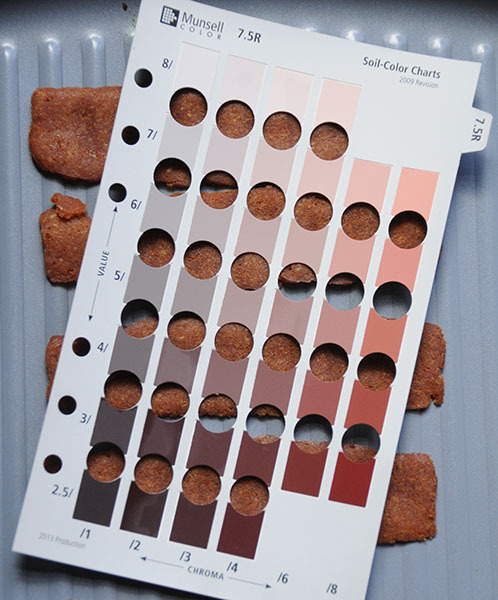 And if you are looking for other food matching opportunities, see the blog on turkey color. 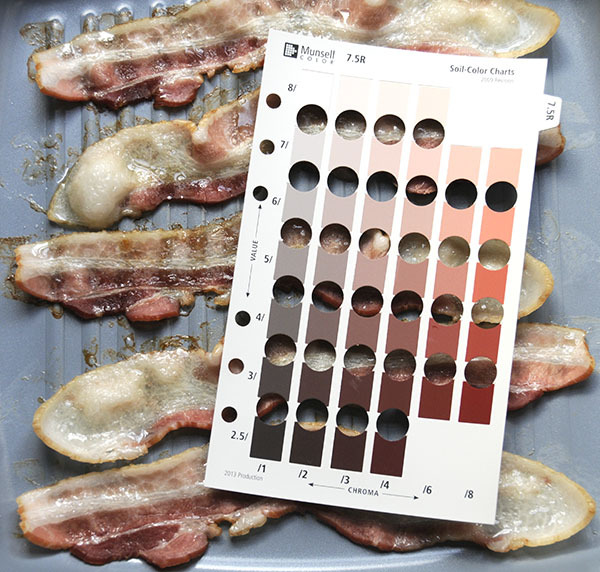 Even if your bacon matches the perfect Munsell color code remember that it needs to be at the proper temperature, 145 degrees for pork with a resting time of 3 minutes (yes a long time to wait for bacon, but well worth it), to be considered safe for consumption. 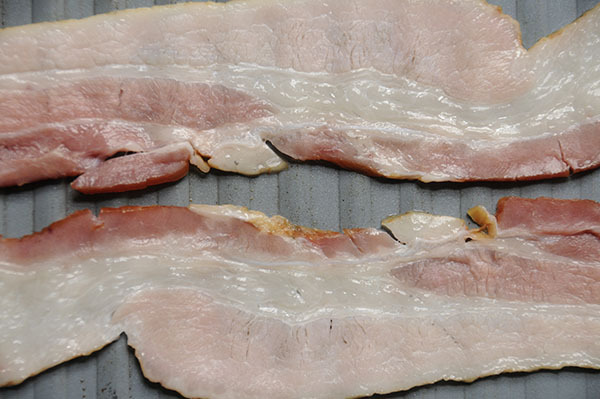 For fake bacon, follow the instructions on the packaging – some are pre-cooked. 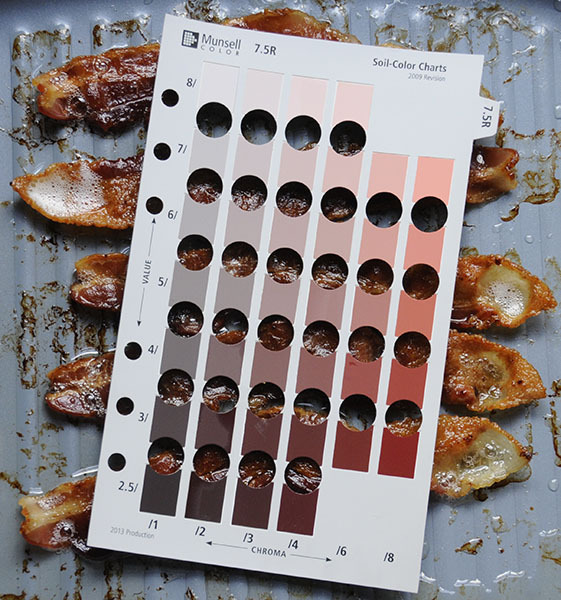 We would love to hear how you like your bacon and what the corresponding Munsell notation is so please share your findings in the comments below. Most importantly, Happy Bacon Day to all!